Toasted Homemade Whole Wheat Bread* Clover Artisan Homestead Organic butter, salted, [source], *Bread made with local home ground flour [wheat berries source], and oil, plus yeast and salt. 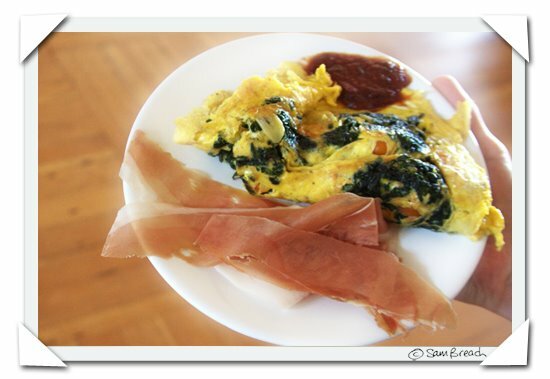 A few slices of the first ever batch of Boccalone's domestic prosciutto in the style of San Daniele [source], Omelette: Icicle-Radish Greens [source], sauteed in homemade chili [source]-oil[source] with garlic, toybox tomatoes[source], creme fraiche [source] and eggs[source] with June Taylor's tomato ketchup [source], Salt & Pepper. burger made from Prather Ranch skirt steak, tomato [Eatwell], icicle radish [Marin Root] and shallot [dirty Girl] salad. Acme sesame burger bun.Crackers and cheese from ? Safeway? ?How do you blog when you've had, perhaps, a little too much to drink? "?How do you blog when you've had, perhaps, a little too much to drink?" try to sit on my hands and not go near a computer. I like it when I can see what you are eating-and that looks delicious! 'Becks and Posh' is modern cockney for 'nosh'. Follow English-Girl-Abroad, Sam Breach, on her culinary travels, mainly in the San Francisco Bay Area, but also further afield, whilst she plays at being amateur restaurant critic, wine taster, food photographer, cocktail connoisseur, party planner, good food forager and practising home cook, with trusted French advisor, Fred, by her side. Salt & Pepper: On the table or not? Is NY Better than SF? Best Mojito in the World? What to do with all that Jam? Can the English make 'Champagne'? This is a Flickr badge showing public photos and videos from SixyBeast. Make your own badge here.